Few years ago my friend had brought a phone called Xiaomi, and I laughed at him for buying a Chinese phone, which is generally faulty and of poor quality. However, with Xiaomi, I got it wrong. Their offerings were of high quality and at a low cost. That is the reason why they are competing with the likes of Apple, Samsung, and others for smartphone supremacy. In this article we will be looking at Xiaomi phones in general and the very cool Mi Account Unlock Tool. 1 Why Should You a Get a Xiaomi Phone in The First Place? 3 What is the Mi Account Unlock Tool? Why Should You a Get a Xiaomi Phone in The First Place? Before using Mi account unlock tool, you should have a Xiaomi phone, so let us see what makes Xiaomi a good buy. 1. Price-performance ratio: Xiaomi phones pack in great specifications at a low price. Even their flagship phones cost less than 400 dollars (INR 26000). 2. Quality hardware and good build material-While its price is comparatively on the lower side, Xiaomi never compromised on its hardware. Many of their phones run on the Snapdragon processors, considered as one of the best processors. Their build quality is also top notch. 3. Camera Quality: Let me get this straight, the Xiaomi camera is a thing of quality. The Mi A1 camera literally gave me the push to start an Instagram account. Even the 100 dollars Redmi 2 can take great pictures and videos at 1080p resolution. 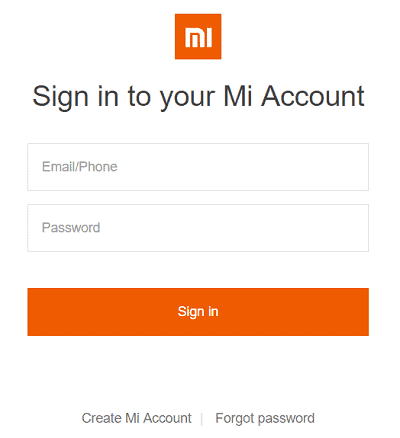 What happens if you forgot your mi account password? In that case, you can use forgot password option but sometimes it won’t work if you didn’t remember mi account id and password. So here you need to bypass the Mi cloud verification to enable the device access again. For that, you need to download mi account unlock tool rar file in your device. Follow this post till the end to know what is the mi account tool and how to use mi unlock tool to bypass account verification. What is the Mi Account Unlock Tool? The Mi account unlock tool is a windows based application which helps in removing or unlocking your Mi account. Sometimes you might forget your account password or worst case scenario- your account might get blocked. The Mi account unlock tool or mi account remove tool can come to the rescue in such situations. Also after a hard reset, you can bypass account on any Xiaomi and Redmi devices using this software. The Mi account is very important to a Xiaomi user, it’s basically what play store is for the Android users. Having a Mi account gives us access to the cloud features of Xiaomi wherein we can sync data like pictures, music etc. If you buy a new Xiaomi phone, then data from the old phone can be imported via logging to the Mi account. 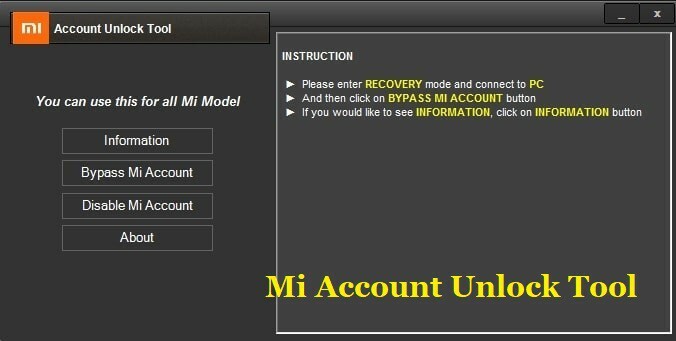 The Mi account unlock tool is supported on Windows 7,Xp,8,8.1,Vista,10(32 bit and 64 bit versions). Basically, this tool is an essential for all the Xiaomi users. You can download Mi account unlock tool rar file by following below steps. it also known as mi account remove tool. 1. First download the mi account unlock tool rar file from the link given here – Mi account unlocker. 2. Make sure the antivirus is turned off before installation as it may delete certain files. 3. Then extract the file to a specified folder and run the setup file. 4. Follow the instructions and click on next button. 6. To activate recovery mode, power off your smartphone and press volume up and power key simultaneously, until you Mi logo. Now press the volume up key. 7. Now is the time to run the Mi account unlock tool and you can connect your phone to the pc via a usb cable. 8. In the Mi account unlock tool there is an information tab, where you can get information about your phone. You can just glance at it, if needed. 9. Next step is to click on the bypass Mi Account option. Your phone will now restart automatically. 10. Disconnect the phone from pc, complete the setup and Mi account unlock tool has done its magic. The great advantage of the Mi account unlock tool is its simplicity, ease of use and more importantly, it is free. It can save you random visits to the service center and gives you the complete Mi experience. If You still have any doubt then feel free to comment. The Mi account unlock tool is a windows based application which helps in removing or unlocking your Mi account.